As concerned as we are with the care of all of our customers’ boats, it is also essential to not overlook the importance of a reliable dinghy. Dinghies not only provide the means for accessing your boat, but can also be a primary safety device. We inspect the dinghies that we have in storage and always give them a good cleaning before their launch. However, it is a good idea to periodically give them a more thorough inspection and service to keep them both looking good and functioning properly. Dinghies for the boats in our care can range from inflatables to those with AwlGrip painted hulls and varnished rub rails. We are all aware of the damaging effects of ultraviolet light to fiberglass, rigging and brightwork, but it can be equally damaging to the surfaces of a dinghy. Any fiberglass surface can benefit from the application of a UV protecting wax and certainly any varnished bits should be maintained. Inflatable tubes made with Hypalon are much more UV resistant and more easily repaired than those coated with PVC. Although there are a variety of products that are available to protect inflatable tubes, we do not recommend their use because they may prohibit a future patch or repair from adhering properly. If you are using a RIB, any penetrations in the rigid fiberglass hull can allow water to enter and collect, which can add significant weight and make her much more difficult to handle and tow. Penetrations can result from various cracks in the fiberglass surface or from fasteners that have pulled free or are in need of re-bedding. 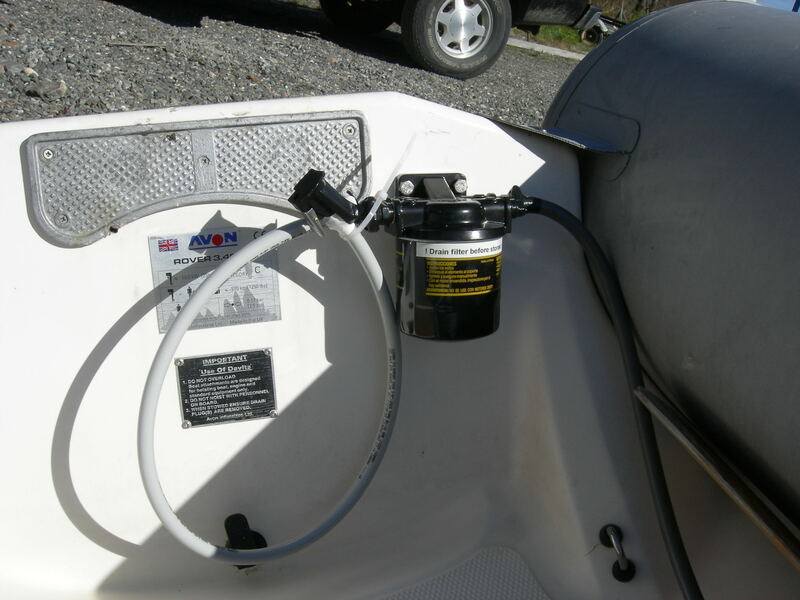 In addition to exterior maintenance, many boat owners have learned that the ethanol in gasoline can pose particular problems for marine fuel systems (outboards in particular). Ethanol is hygroscopic, which means it pulls water out of the atmosphere. Even a small amount of water in the tank can cause the fuel to separate, with the water saturated alcohol on the bottom. If this water/alcohol solution reaches the engine, it may sputter, stall, or eventually die. A solution that many boat owners have employed to prevent this is the installation of a fuel/water separator in the fuel delivery line. These systems will remove water that has been introduced not only by ethanol, but from condensation that can occur when the tank has been left unused for an extended period of time. Safety equipment should be present and in good condition. There should be a sound signal, proper personal flotation devices and one electric distress light or three combination red flares (for use when operating between sunset and sunrise). A good bailer and oars are also valuable to have on board. A boat under oars between sunset and sunrise should have at a minimum, a white flashlight or lantern.